9 The address of Museum Asian-African Conference Building. 10 Directions to the Museum of Asian-African Conference. 11 Opening Hours Museum Asian-African Conference Building. Has a history that determine the world in turmoil of the cold war between American and the Soviet Union, the Asian-African conference museum as a living testimony of how Indonesia in his time plays a very important in the international political arena, and the city of Bandung as the capital and source of inspiration for Asian and African nations that time. is the witness of history that right in Bandung on 18-24 April 1955 ever held a grand celebration of international standard that brings all the leaders of the countries from Asia and Africa region. Asian-African Conference in 1955 which was initiated with the aim of uniting the attitude and build cooperation among the nations of Asia and Africa as well as help create the orderliness and world peace. So that one of the results of the history that is created from the biggest international conference Bandung that time is the birth of the Ten Principles of Bandung were very famous and Phenomenal, which with the Ten Principles of Bandung that serve as guidelines and the spirit of the nations on the continent of Asia and Africa, who was many still colonized, to struggling for the rights of independence. Great accomplishment achieved by Asian-African Conference in 1955, which has managed to determine the history of the World at the time and then afterwards, to perpetuate the success of the Conference of the Asian Conference African, ranging from events and issues underlying the convening of the Asian-African and influence its success, then built a museum at the conference ever took place, Gedung Merdeka in Bandung. Was Prof.Dr.Mochtar Kusumaatmadja who initiated the first construction of Museum of Asian-African Conference at Building Merdeka. By the reason many heads of state in Asia and Africa who wish to see and visit the birthplace of the Declaration Ten Principles of Bandung which very historic. Development of which Asian-African Conference Museum project execution, carried out by PT.Decenta Bandung made by two Dutch architects, namely Van Galenlast and CO Wolf Shoomaker which a professor at the Technische Hogeschool / Technical College is known ITB now. 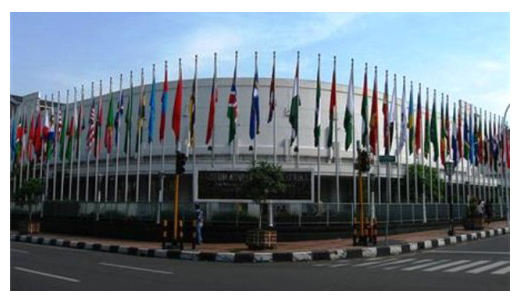 first opened the establishment carried out by late President Soeharto on 24 April 1980, at the same time it is a culmination of 25 years anniversary of the Museum-Asian-African-Conference in Bandung as well as make this location as Tourist Attractions in Bandung. This place has the concept of Art Deco building with the ground floor from marble material, which was imported directly from the country of Italy which famous, and very shiny from its color. While the room is made from strong cikenhout woods and lighting using lamps which provide light sparkling crystals. Museum of Asian-African Conference itself in the Dutch colonial period known as Sociteit Concordia, which for the Dutch people who live in Bandung that time, is a place of recreation and is often used as a place of cultural performances as well as Culinary spots. The museum building has a permanent exhibition space which exhibits a collection in the form of three-dimensional objects and documentary photos of events Tugu Meeting, the Colombo Conference, Conference Bogor, and the Asian-African Conference in 1955. The library has many books on history, social, political, cultural and Asian countries of Africa, and other countries; documents concerning Asian-African Conference, as well as magazines and newspapers, and ‘Braille Corner’ for the blind. The room is to be a means for the screening of documentaries about world conditions until the 1950s, the Museum-Asian-African-Conference and its continuation conferences, as well as films about the culture from The countries of Asia and Africa. Museum of the Asian-African improve various studies on the Asia-Africa and abroad as well as facilitating research at home and abroad which conducted by researchers and students. a. Guiding tour performed to the visitors, both the government and the official visit of a group visit/public. b. Temporary exhibitions. Museum-Asian-African-Conference held temporary exhibitions in an effort to educate the public with regard to the implementation of foreign policy and diplomacy Indonesian history. This temporary exhibition is done also at locations outside the Museum of the Asian-African Conference. At the Museum of the Asian-African communities are formed or supported by the Museum-Asian-African-Conference. Various communities in shape in order to increase knowledge about history, international politics, given the national awareness about-faced in Indonesian foreign policy in the future, in public diplomacy and diplomacy among citizens (citizen diplomacy). Some of the activities organized in cooperation with the communities among which: Book Discussion, Film Discussion, various Festival, Culture Clubs, Fairs, etc. The address of Museum Asian-African Conference Building. Gedung Merdeka which has two main buildings covering an area of 7500 m2, which is the main venue called Gedung Merdeka, while the museum building beside it is the Asian-African conference as memorabilia located at Jalan Asia Afrika No. 65 Bandung – West Java, Indonesia. Directions to the Museum of Asian-African Conference. – From Cicaheum Bus Terminal: Take the bus Cicaheum-Leuwi panjang. Bus Stop off at the Asia-Africa. Walk as far as approximately 100 meters to the west towards the Square Bandung. – From Bus Terminal Leuwi Panjang : Take the bus Cicaheum-Leuwi panjang. Get off at Bus Stop Bandung Square. Walk around 100 meters to the east towards Braga street. – From Bandung Train Station: Take public transportation St. Hall-Gedebage. Get off at the intersection of Braga-Naripan street. Walk to the south as far as approximately one hundred meters towards Braga street. – Do not run around the museum. Speak in a calm tone. Use a low voice in all areas of the museum so as not to disturb other visitors. – Please do not eat, drink, chew gum, or using other tobacco products in the museum except in the museum cafe. – Visitors are not allowed to carry weapons or similar. – Not allowed wearing flip-flops or similar. – It may take pictures but do not use the flash and tripod (tripod). – To improve the interaction, visitors are advised to reduce the use of cell phones except in emergencies only. – Do not touch the artifacts. – Do not use the exhibition as a base for writing. Opening Hours Museum Asian-African Conference Building. Monday to Friday 8:00 AM-15:00 PM and the museum closes at noon (12:00 to 13:00) for a lunch break. While visitors with special needs and visits in groups of more than 25 people are required to make reservations in advance, make a call to (022) 423-3564 or Fax (022) 423-8031. Admission prices Museum-Asian-African-Conference.Tourists visiting the Museum of Asian-African Conference exempt from paying admission or FREE! unless there is a specific purpose or interest of a commercial character. For those of you which are planning a vacation or visit to Bandung, please try to visit this Tourist attraction, the Asian-African Conference Museum building.